The Endurance 5K is the cheapest model from the Endurance brand. But don’t let the price fool you, even though it is only around $1,000, it still comes with the in-home lifetime warranty this company is known for. This machine fits people who are on a limited budget but would still want a decent treadmill. However, I strongly advise you read the whole review first before making any buying decision. This Endurance model comes with a 2.2 HP continuous duty motor. This motor can give you speeds of up to 10mph and can elevate up to 12%. Thus, allowing you to have an intense workout no matter what fitness level you’re in. The 18inch x 50inch 2-ply tread belt comes with shock absorption system which cushions stride impact. I don’t see any problem with the cushioning however I believe that the running surface is a little small considering its price tag. So I suggest you try to run on it first before you buy. The 4-window console provides real-time displays of your elevation, time, distance, speed and calories. Hence, you’ll always be able to measure your progress. There are also 6 total workout programs built into this treadmill: 2 manual, 1 fat burning, 1 cardiovascular, 1 interval training and 1 endurance program with user controlled speed and incline adjustments. These programs were included to give you more variety in your workouts. Other than the lifetime warranty, this treadmill is pretty ordinary. Endurance should have added more features and upgraded some specs. I don’t recommend the Endurance 5K treadmill. It lacks the specs and features to be really worth the price they’re asking for it. Warranty: Lifetime on everything except for the 1 year labor warranty. If you plan on buying an Endurance 5K treadmill, I suggest you locate a dealer through amazon. 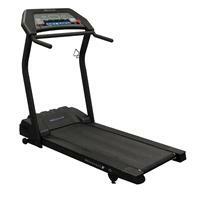 It is the home page of Endurance treadmills. You can get it for just $1,099.